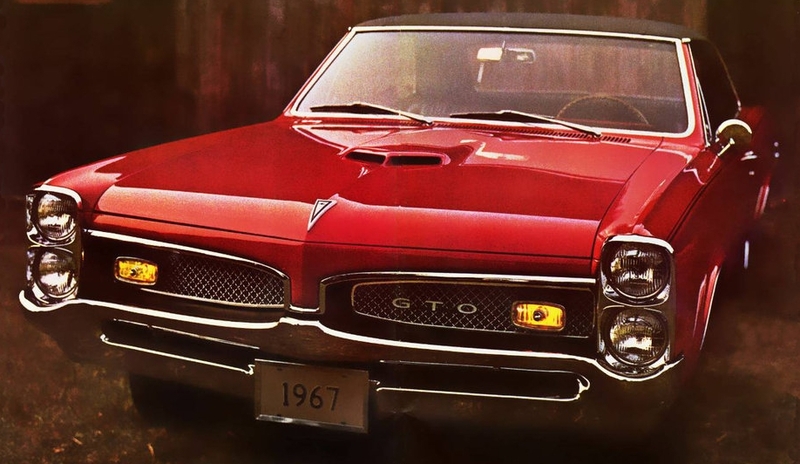 The GTO was the cornerstone of Pontiac performance. It was a car that created the muscle car segment and hit a bullseye with the wants and needs of the emerging youth performance car market back in the 1960s. It can’t be stressed how important the GTO was to introducing true high-performance to the American car market. Here’s a brief look at part 1 of those wonderful GTOs from 1964 to 1974. A period long gone and never to return. Pontiac had successfully forged a new performance image for itself with the introduction of wide track in the late 1950s. A few brave men at Pontiac led by John Delorean had decided to up the ante for the 1964 model year, with the introduction of a mid-sized high performance car. The mid-sized 1963 Pontiac Tempest could at best be ordered with a 326 cubic-inch V8, which Delorean surmised correctly, was just not enough for performance oriented buyers. Delorean and his team at Pontiac were planning a revolution not only within the GM structure but a revolution that would rock the whole auto industry. Their plan was to offer an option package on the 1964 Tempest called the “GTO”. This option package was to consist of a 389 cubic-inch V8, a special handling package, dual exhaust, and a few “GTO” badges. When the 1964 GTO was released it created a frenzy, its performance and handling were among the best in its day. Buyers lined up in droves to purchase the 32,450 GTOs produced during the 1964 model year. 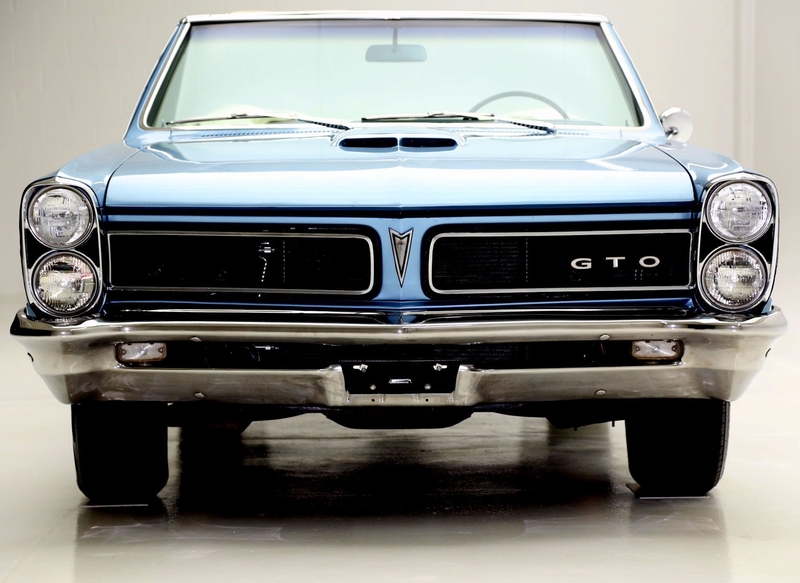 It did not take Pontiac and its competition long to realize the GTO was a smash success. The 1964 GTO’s optional Tri-Power 389 (which had 3 x 2-barrel carburetors) produced a mighty 348 gross horsepower while the GTO’s standard 389 produced a still impressive 325 gross horsepower. In 1965 the good thing continued but with even better styling from its new double-decker headlight and dual front grille design. Performance climbed for 1965, the standard 4-barrel 389 increased to 335 gross horsepower while the optional Tri-Power 389 increased to 360 gross horsepower. With the great success of the GTO, a few competitors were now beginning to emerge into this new car category called “muscle cars”. GTO production for 1965, more than doubled over 1964 figures, 75,352 was the final tally. The GTO in 1966 became its own model no longer an option package on the Tempest/LeMans. The 1966 GTO was slightly bigger than the 1964–1965 GTO. It was longer, wider, and had a meaner front grille and new double-decker headlight design when compared to the 1965 GTO. The Tri-power and 4-barrel 389 V8s carried over from 1965 with the same horsepower ratings. There was a factory Ram Air option for the Tri-Power 389, it has been estimated that only 25 to 35 GTOs were ordered with this option for 1966. The 1966 and 1967 GTO had what was referred to as coke-bottle styling derived from the 1966–1967 Tempest/LeMans. By 1966 many GTO imitators were now on the scene – Buick, Oldsmobile, Ford, Mercury, Dodge, and even Plymouth had entered into the muscle car market by stuffing a large displacement high performance V8 into a mid-sized car. Pontiac was not worried since GTO sales continued to be very strong for 1966 with 96,946 units being produced. For 1967 the 389 was replaced by a 400 cubic-inch V8. There were four engines to chose from: an economy 265 gross horsepower 2-barrel 400, a 335 gross horsepower 4-barrel 400, a 360 gross horsepower 400 HO, and 360 horsepower 400 Ram Air. 81,722 GTOs were produced for the 1967 model year. The verdict was in, America loved muscle cars and the GTO was America’s muscle car.